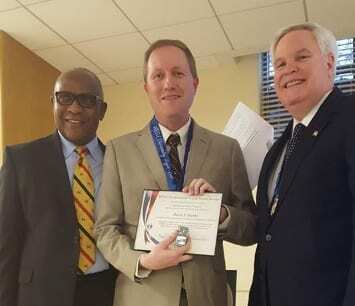 Baltimore County Councilman David Marks has received the National Eagle Scout Association’s Outstanding Eagle Scout Award, one of five recipients from the Baltimore Area Council. He was honored at a Thursday meeting for Boy Scout Troop 124, the unit where his son Nicholas is a member. The presentation was done by Scout Executive/CEO Brian Steger, Council Board Chair Trey Shupert, and former Council Board Chair Barry Williams. Councilman Marks received his award in October of 1988, and he has remained active in Scouting during his adult life. He is currently Chairman for the Dulaney District, which includes Scouts from eastern and northern Baltimore County. Councilman Marks is a merit badge counselor, has advised on numerous service projects, and attends over a dozen Eagle Scout investitures every year. “Receiving the Eagle Scout rank in 1988 was one of the highlights of my life. It culminated years of work, and it helped prepare me for the demands I would later experience in life ,” Councilman Marks commented.